The Oxford Conference has now taken place. To sign up for future related event please complete the reply form. 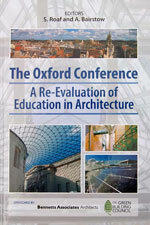 In bringing together thinkers from all over the world, the 2008 Oxford Conference developed an extraordinary vision and impetus for a new direction in architectural Education. This DVDs provide a unique opportunity for teachers, students and practitioners to share and stay informed about the issues covered in the conference. It contains one to one interviews with speakers and industry leaders and highlights froth conference presentations and Oxford Union Debate. Proceedings from the conference are available at £25 per copy. To order please download the order form.